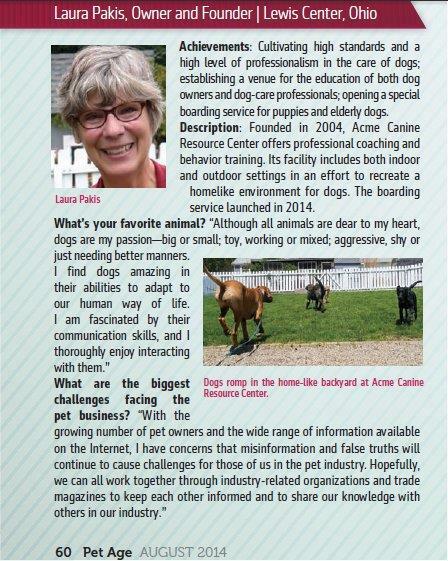 People love their dogs; they also love their gardens, but sometimes these two passions seem to be in conflict. There’s no reason that you can’t have both dogs and attractive landscaping. But landscaping with dogs does present challenges that may require some compromises. The goal in this balancing act is to achieve an attractive, dog-friendly yard. Many gardeners are concerned about dogs and lawns. 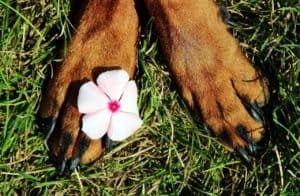 While it’s true that dog urine can be damaging to grass, there’s a lot of mythology on this topic. The damage done by dog urine on lawns and other ornamental plants is caused by excess nitrogen in one spot, and that “burns” plants. If you could spray water consistently every time wherever there is dog urine on the grass, the problem would go away, and the diluted nitrogen would actually green up your lawn. 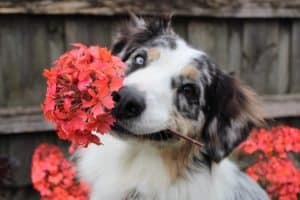 You can avoid problems by training your dog to go potty in a particular part of the yard – preferably well away from your favorite outdoor living spot. It isn’t much harder to train than it is to housetrain in the first. But clean up often. A dog will start avoiding the toilet area if it’s filthy. Put dog poop in the garbage, or flush it down the toilet. Don’t add to your compost pile, as it could contain worms or other hazards. You may want to consider switching to a different type of grass. Some grasses hold up better to paw traffic than others. Among the warm-season grasses, Bermuda grass is among the toughest. For a cool-season grass try Kentucky bluegrass. But if you’re trying to get a new area of lawn established, sod is easier to establish than seed if you’ve got pets. An alternative type of “green carpet” is clover. Clover lawns have many advantages over grass lawns one being the fact that clover doesn’t stain the way grass does after being subjected to dog urine. Like people, dogs make a beeline to where they want to go. If your dog wears a dirt trail into the lawn, consider switching from a grassy expanse to hardscape. The advantages of hardscape goes beyond solutions to landscaping with dogs, since hardscape offers a low-maintenance alternative to grass. Stone walkways exude charm and are a desirable addition to your landscaping regardless of dog problems. Stone and masonry are especially useful for landscaping with dogs, because they minimize the mess dogs make through urination, digging and plain old wear and tear. Avoid bark mulch. Dogs can easily disturb or ingest mulch so its better to use an inorganic product. Crushed stone mulch is maintenance-free, holds up to dog traffic and provides a clean look. Containment If you are building a fence, think OVER, UNDER and THROUGH. Make sure the fence is 4 to 6 feet high so your dog cannot get over it. Avoid gaps in between the fence to prevent a dog’s head being wedged and between the fence and the ground. Ensure that the fence extends well below the ground, to deter your dog from digging its way out. Don’t try to grow any plants in the area immediately adjacent to the fence. Dogs are territorial, and their favorite path in a fenced-in yard will be right along the fence. Unsightly “dog paths” are the result of this predictable behavior. 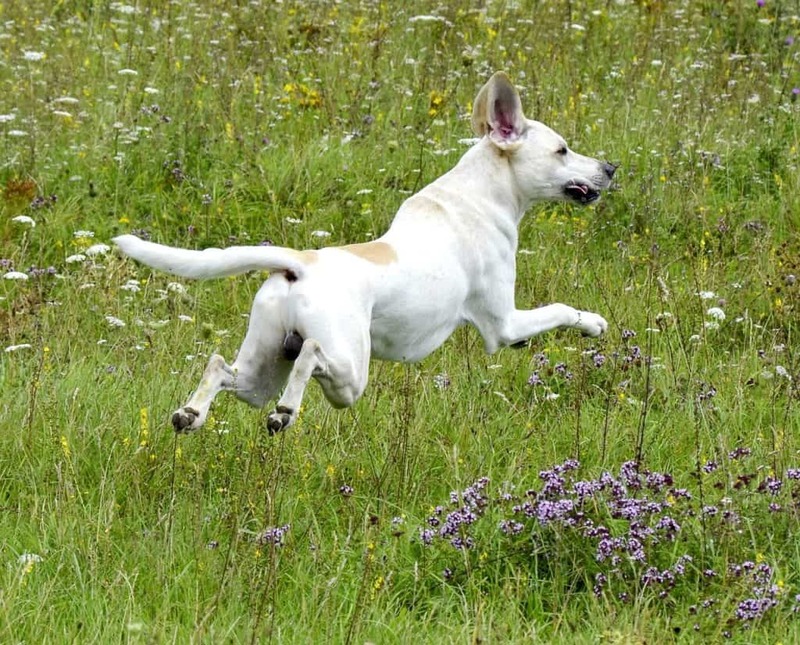 Rather than fighting it, plan your yard around your dog’s predictability. If the plantings in your yard possess any significant degree of diversity, there’s a good chance that you’re growing poisonous plants — without even knowing it. You’d be surprised at how many of the most common landscape plants and native volunteers contain at least some parts (leaves, berries, etc.) that are toxic. Rather than rattle off a list contact Acme Canine for a list of some of the more common poisonous plants. 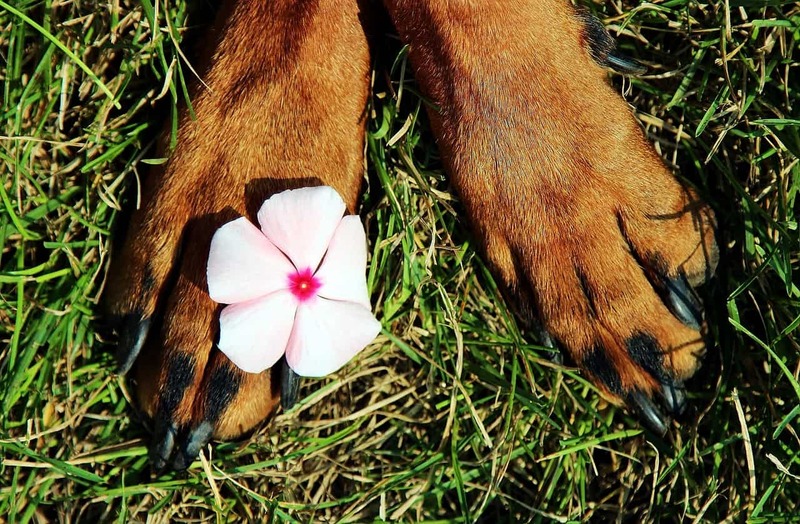 In a pet-friendly garden avoid bare soil – it’s a perfect invitation to dogs to dig. Consider using ground covers like thyme, cotoneaster, sweet woodruff or periwinkle between larger woody plants. When choosing plants, choose robust plants that can cope with being trampled and try to keep your garden densely planted all year round – densely planted areas are often good deterrents to dogs, especially if you train them that these are no-go areas. Grasses are particularly tough plants that are unlikely to be injured by the most rambunctious of dogs. Keep delicate plants in containers or behind a barrier. Eye level barriers, such as rope strung between wooden posts, or low-level box hedges can protect these plants. In addition a dog is less likely to go crashing through a raised flowerbed than one at ground level. With some research and planning your backyard and your dog can coexist quite nicely. 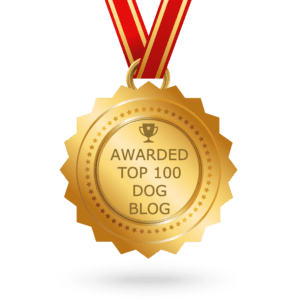 This entry was posted in Responsible Dog Ownership and tagged dogs and plants, gardening, mulches and dogs, poisonous plants for dogs. Bookmark the permalink.